Welcome to White Trash Matt (dot) com. I own Low Tide Tattoos in Jessup, Maryland and Melbourne, Florida. I travel to the Maryland location to tattoo every few months. 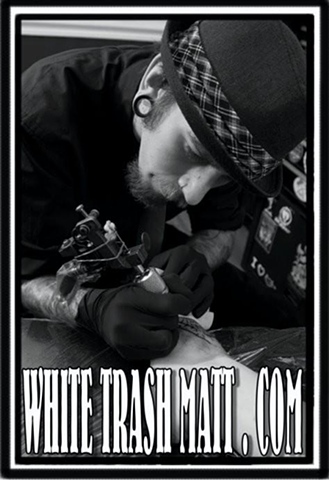 If you would like to get put on my email list for appointment availability, please send a message to Matt@LowTideTattoos.com with your contact information and I will get back to you. I enjoy tattooing anything aquatic, ocean related, and anything with bold lines and bright colors. I also enjoy doing illustrative tattoos, micro tattoos, black and gray cover ups. I respectively do not DISCUSS or GIVE PRICE QUOTE's over the internet or telephone, every piece is unique. Appointments are made in person with a deposit that will go towards the tattoo.